The first time we came here we sat out on the patio area and it was a bit gloomy out so I wasn’t thrilled with my photos. 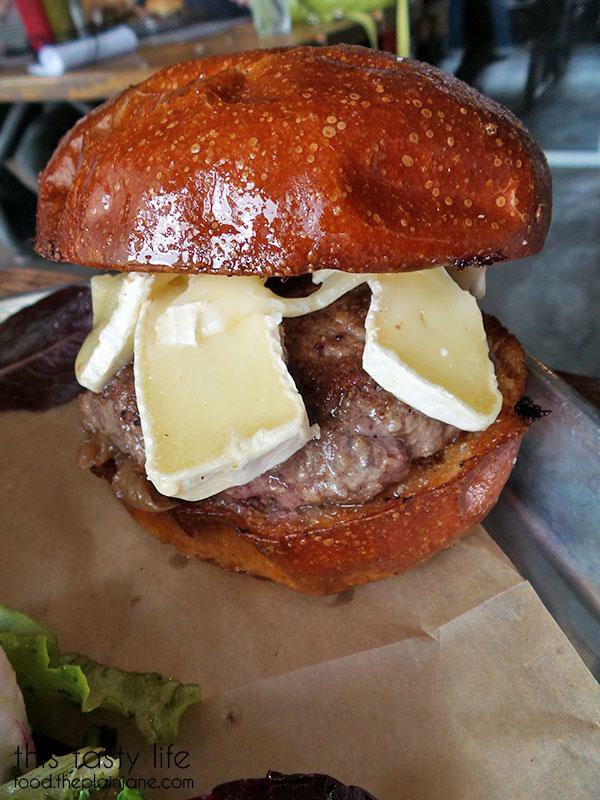 I tried out the brie burger because hello: it has BRIE on it. OF COURSE I would order this. I had to restrain myself from ordering it on my second visit so I wouldn’t get into that rut of ordering the same thing over and over. 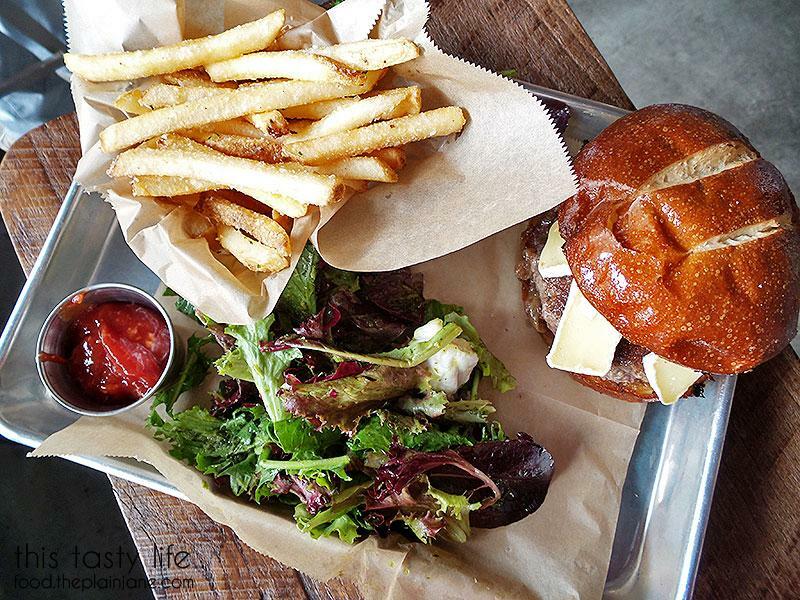 I really liked the pretzel bun on this burger. It was glistening and looks so inviting… om nom nom! The patty itself was nice and medium rare just how I liked it but I do wish they had bothered to melt the cheese a little. It’s just straight up slices of brie. Melted brie is much more magical than unmelted brie. 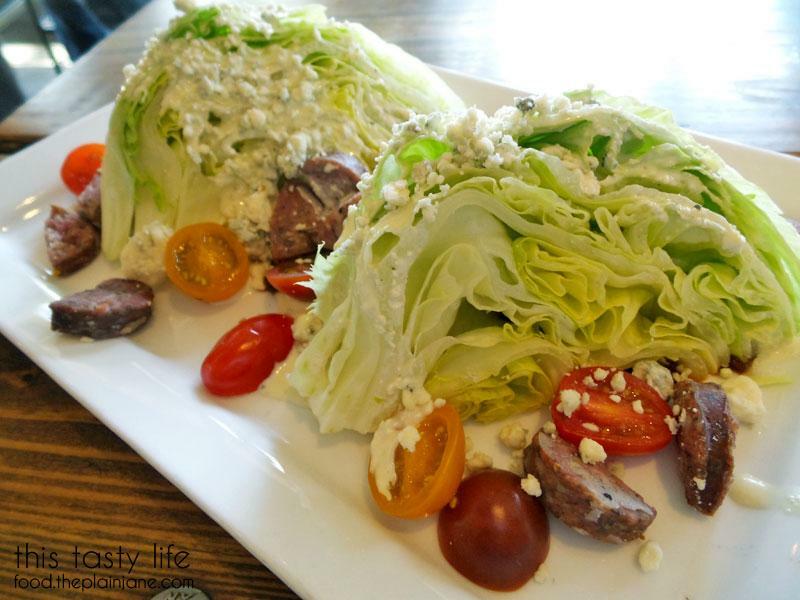 On my second visit, I was really feeling the salad thing and decided to get the Wedge Salad. 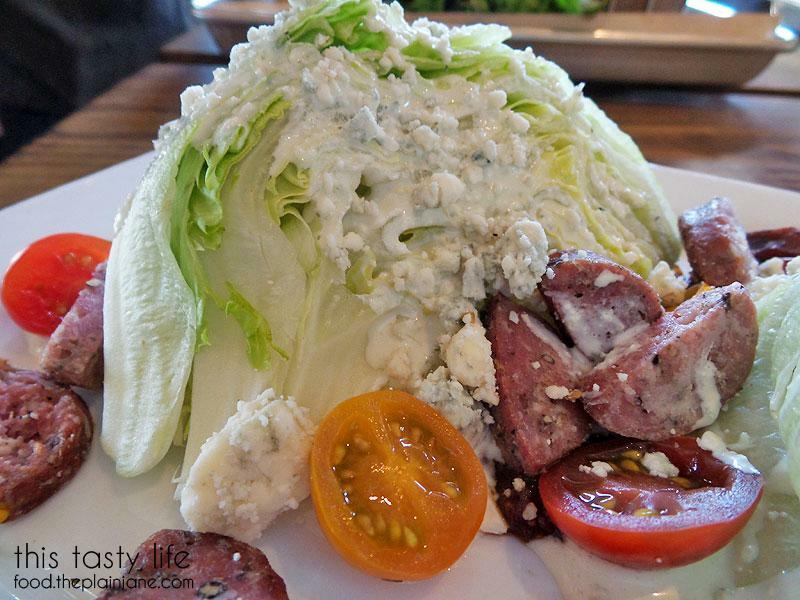 Wedge salads usually have bacon with them but instead of bacon, Draft Republic serves it with some nice slices of smoked kielbasa along with heirloom cherry tomatoes, fig jam, and blue cheese. The fig jam is hiding under the wedges. I liked the nice chunks of meat that came with the salad and the little tomatoes were so bright and fresh! Plus look at those gobs of blue cheese (blue cheese haters please turn away)! There was plenty to go around for each and every bite of salad. My co-workers commented and made fun of my salad a bit since it’s basically just iceberg lettuce cut in half. I told my salad to not worry about them and that little wedge salad was perfectly lovely, even if I had to use a knife to eat it. 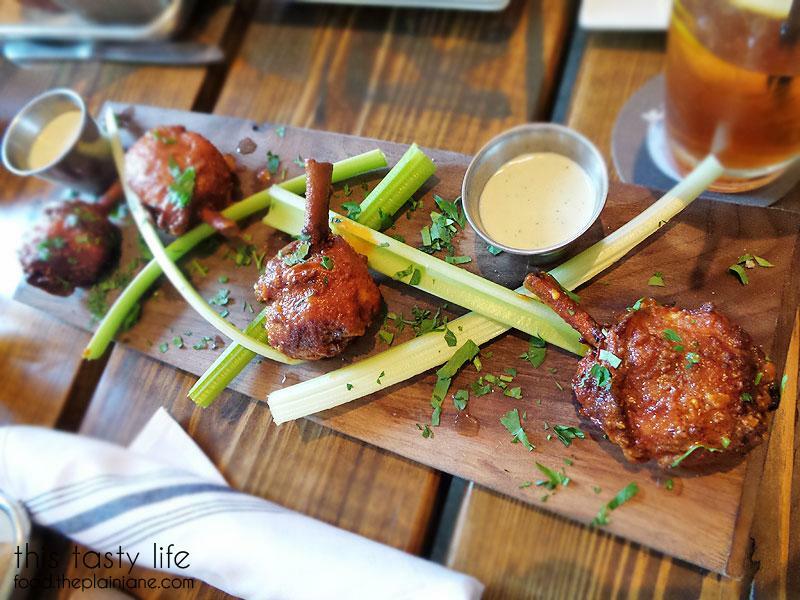 Okay, mostly I got the salad because I needed to offset this sucker: the “Maple Bourbon Bacon Sticks”. 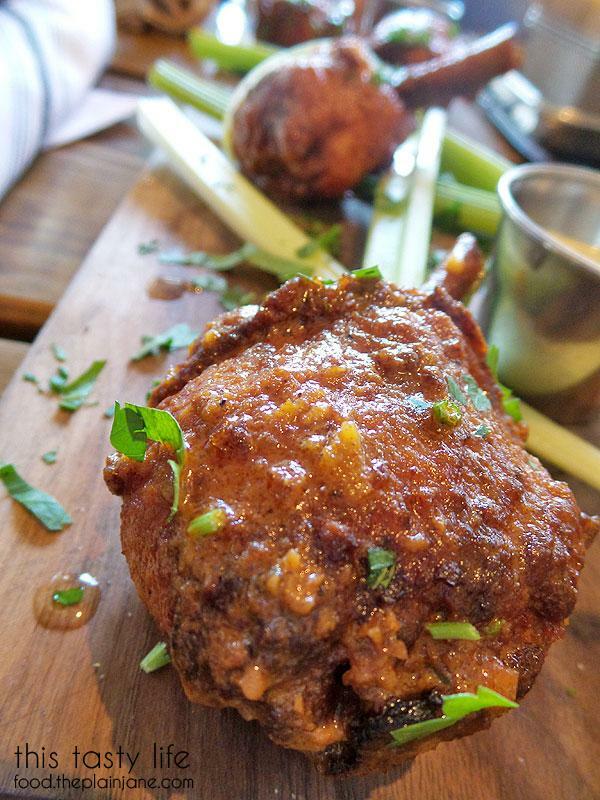 It’s basically large hunks of pork belly on a stick! Why does putting it on a stick make me so much more excited to eat it?! Maybe that’s why fair food is so exciting… everything’s on a stick! This… was truly luxurious to eat. Nice, thick, juicy chunks of pork belly with a sweet maple glaze. 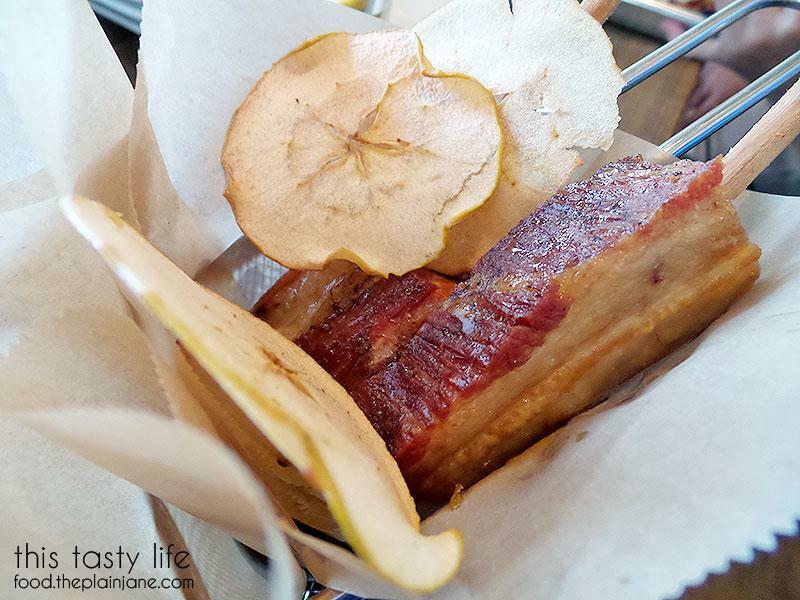 It is a bit fatty in spots, but hello – you’re eating pork belly! You better be expecting something that like. It’s not like you’re eating a lean chicken breast. It is fatty and delicious and totally wonderful. I made Minion eat one because I did not think I could eat all three by myself. There are also dried apple chips included to make you feel slightly better about eating pure pork belly. You can say, “But look, there’s something healthy that goes with it!” I ate half of one apple chip. I decided they were for decoration only. Minion got fries! I didn’t eat any of these but he’s always nice and let’s me photograph his food. 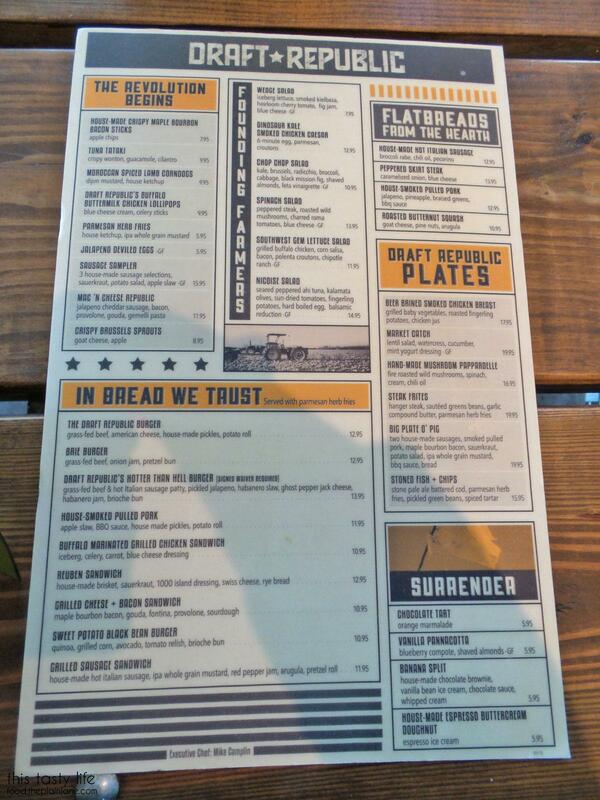 Minion also got these things which have like, the longest menu name ever. I like how it looks all “freestyle” with the celery thrown about. Do you think they just tossed it on there or did they carefully arrange it to LOOK like it was tossed on there? I didn’t try these either, but I thought they looked mighty tasty. Chris and Minion are shown here toasting lollipops/doing a foodie high five and it was too funny to not snap a photo of. 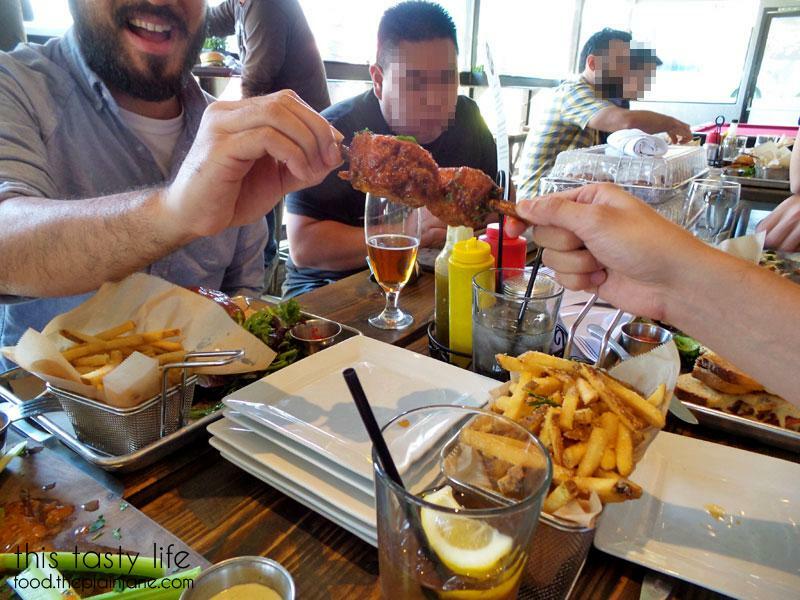 Foodie high fives all around, people! 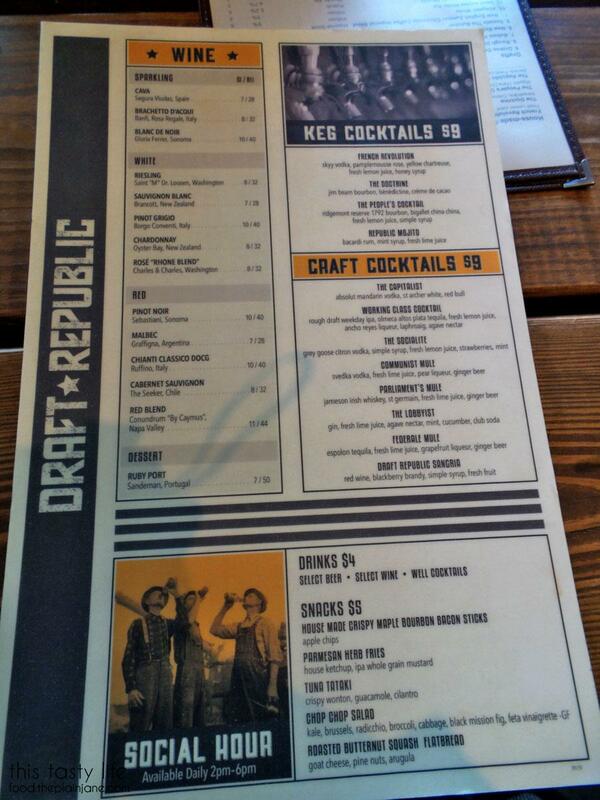 Draft Republic is a really fun spot, especially for large groups. They’ve got a lot of beer (which I do not partake in on lunch breaks due to the fact that I am an extreme lightweight). They’ve got plenty of different options to appeal to various tastes and there’s lots of seating and lots of games to play. They even keep the entertainment going when you’re washing your hands in the bathroom by showing movies in there! It’s crazy cool. You should go check it out. may the fourth be with you – it’s star wars day! That brie looks scary. Like two bunny fangs hanging out of the bun’s mouth or something. Does that much cheese over power a burger? And cold unmelted cheese. I agree with your friends about the iceberg lettuce. 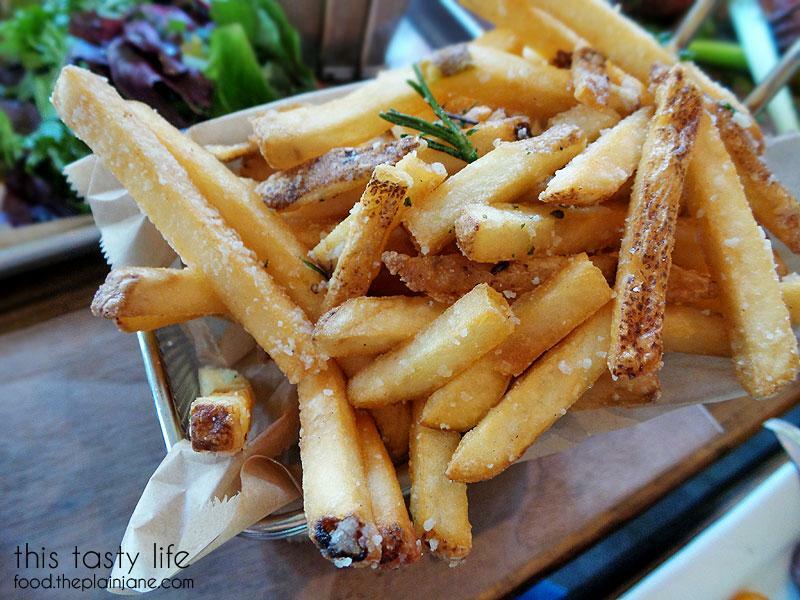 I can easily cut a head of lettuce into those wedges and serve it on a plate ta ya. That’s interesting about the fig jam on the bottom of the wedges. Did the chicken still have the skin on? No, I don’t think it overpowers the burger but I’m a little biased because brie is my favorite cheese! I do prefer it hot and melted though. Geez. Yes, the skin was still on those little drumette/lollipop chicken things! I liked their sausage sampler here. The pork belly on a stick was also really good although the fried apple chips didn’t really do much for it. Just give me more of that pork man. Great lunch you guys had except for the blue cheese stuff. (Shudder). Hi CC – I’ve been wanting to try that sausage sampler! Maybe next time. Yeah, the apple chips were like a decoration to me more than anything else. They didn’t taste that great either – chewy apples, what? Hi J.S. – Happy hour might be something I need to check out soon, then! Cheaper prices are always a nice thing. I love crispy pork belly, the mushier versions aren’t my favorite either. Crispy or else! The apple chips seemed totally random to me. At least someone is eating them!